Most Americans (65%) continue to favor building the Keystone XL pipeline, perhaps the most politically contentious energy issue in Barack Obama’s second term. Yet when it comes to another issue making headlines – a proposal to tighten greenhouse gas emissions from power plants – the public favors stricter limits, by exactly the same margin as the Keystone pipeline (65% to 30%). Opinions on these two hotly debated issues underscore the complexity of public attitudes on U.S. energy policy. Support for increasing energy production from some traditional sources remains strong: 58% favor increased offshore oil and gas drilling in U.S. waters. Yet over the past year, opposition to the drilling process known as fracking has increased, as has opposition to nuclear power. Just 38% favor promoting the increased use of nuclear power while 58% are opposed, the highest level of opposition since the question was first asked in 2005. The national survey by the Pew Research Center, conducted Sept. 4-8 among 1,506 adults, finds that, as with other energy-related issues, there is a sharp partisan divide on the Keystone pipeline. But while an overwhelming majority of Republicans (82%) favor construction of the pipeline, so too do 64% of independents and about half of Democrats (51%). President Obama’s decision about whether to go ahead with the pipeline is expected in the next few months. Environmental groups staunchly oppose the project, while GOP lawmakers are stepping up pressure on Obama to approve it. The survey was conducted before the EPA announced its proposal to limit greenhouse gas emissions from new power plants. Nearly two-thirds of the public favors stricter emissions limits on power plants, including 74% of Democrats, 67% of independents and 52% of Republicans. Overall, 44% favor and 49% oppose the increased use of fracking, the drilling method that uses high-pressure water and chemicals to extract oil and natural gas from underground rock formations. In March, there was more support (48%) than opposition (38%) for more extensive use of the drilling process. The rise in opposition to fracking has come among most demographic and partisan groups. 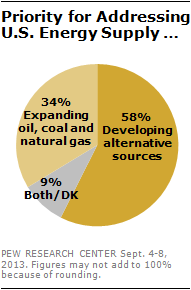 In terms of broader priorities for the nation’s energy supply, a majority of Americans (58%) say it is more important to develop alternative energy sources, such as wind, solar and hydrogen technology, while just 34% say expanding exploration and production of oil, coal and natural gas is the more important priority. These views are little changed from February, when 54% said more important to develop alternatives and 34% said more important to expand production from traditional sources. There are age differences in opinions about a number of energy policies, but they are particularly stark in views of overall energy priorities. Fully 73% of those younger than 30, and 61% of those 30 to 49, say it is more important to develop alternative energy sources; among those 50 and older, only about half (48%) view alternative energy as the greater priority. The survey finds that the recent energy boom in the United States has not registered widely with the public: only 48% correctly say that U.S. energy production is up in recent years and just 34% attribute it mainly to greater oil, coal and natural gas, even though oil and gas exploration has been the primary driver of this trend. 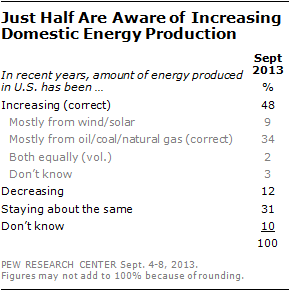 There is no indication that awareness of the nation’s growing energy production is related to energy policy attitudes. For instance, among those who know that energy production is growing mostly from traditional sources, 57% prioritize developing alternative energy sources. That is about the same percentage (58%) among those who do not know this. Support for the Keystone XL pipeline has remained fairly stable during the past six months (65% today, 66% in March), though opposition has risen from 23% to 30%. During this period, the Obama administration has continued to weigh whether to allow completion of the pipeline, which would transport oil from Canada’s oil sands through the Midwest to refineries in Texas. Because the pipeline would cross an international border, the northern leg requires federal approval. The southern portion does not, and much of it has been constructed. Republicans overwhelmingly support constructing the pipeline. Eight-in-ten conservative Republicans (84%) and 76% of GOP moderates and liberals favor building the pipeline. As was the case in March, Democrats are internally divided: By 58% to 41%, conservative and moderate Democrats favor construction of the pipeline. Liberal Democrats oppose the proposal, by 54% to 41%. While majorities across all age groups back the Keystone XL pipeline, there is less support among young people. 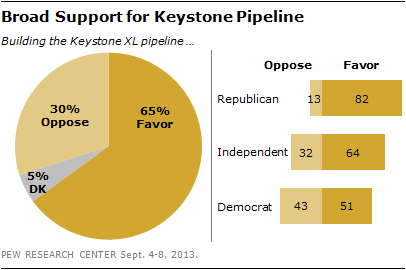 Among those younger than 30, 55% favor building the Keystone XL pipeline while 39% are opposed. People 30 and older favor it by more than two-to-one (67% to 28%). The balance of opinion favoring the pipeline is roughly the same in the six states it would pass through as in other parts of the country. In the six states the pipeline would traverse – Montana, South Dakota, Nebraska, Kansas, Oklahoma and Texas – 69% support its construction while 28% are opposed. Those in other states support it by a margin of 64% to 31%. Since March, opposition to increased fracking has grown significantly across most regions and demographic groups. 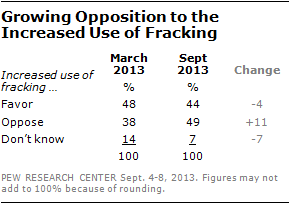 Overall, 44% now favor increased use of fracking while 49% are opposed. In March, support exceeded opposition by 10 points (48% to 38%). Opinion about the increased use is now divided in the Midwest and South. In March, support exceeded opposition by 23 points in the Midwest and 18 points in the South. Opposition also has risen in the West, from 44% to 55%. 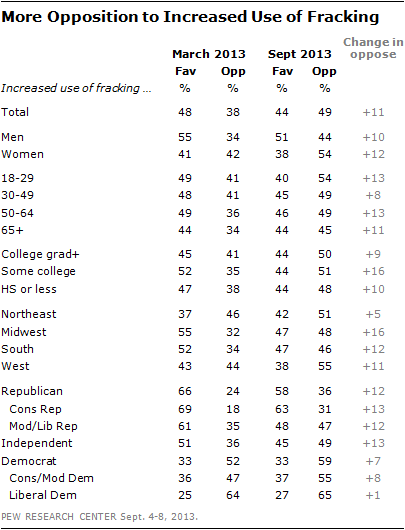 In the Northeast, more continue to oppose (51%) than favor (42%) increased fracking. While opposition among both men and women has increased since March, there continue to be wide gender differences over the increased use of fracking. 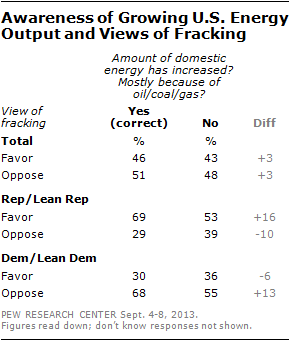 About half of men (51%) favor more fracking compared with 38% of women. Independents and Republicans are more likely to oppose fracking now than in March (by 13 points and 12 points, respectively). Democrats’ views have shown less change, but a majority of Democrats continue to oppose increased use of the drilling method (59%). Overall, people who are aware that U.S. energy production is growing – and that the increase is mostly coming from traditional energy sources (34% of the public) – have about the same views of fracking as do the majority of Americans who are not aware of this. However, opinion is more divided along partisan lines among those who know that energy production is increasing from traditional sources. Fully 69% of Republicans and Republican leaners who know that the energy supply is increasing and that the growth is mostly from sources like oil, coal and natural gas favor increased use of fracking. Conversely, a nearly identical percentage of Democrats and Democratic leaners (68%) who are aware of trends in domestic energy production oppose increased use of fracking. Opinion is less sharply divided among Republicans and Democrats who are unaware that the domestic energy supply is increasing, mostly as a result of more production among traditional sources. By nearly three-to-one (73% to 25%), the public supports requiring better vehicle fuel efficiency. An identical percentage (73%) favors federal funding for alternative energy research, while two-thirds (67%) back more spending on mass transit. Nuclear power has lost support over the past year. 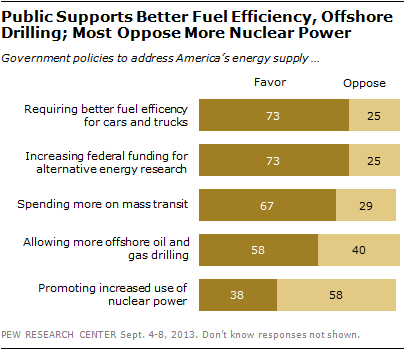 Currently, 38% favor the increased use of nuclear power while 58% are opposed. In March 2012, opinion was more closely divided (44% favor, 49% oppose). 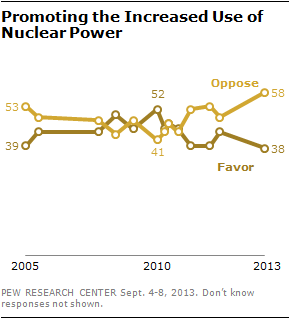 As recently as February 2010, significantly more favored (52%) than opposed (41%) the increased use of nuclear power. There are substantial partisan differences in opinions about each of the energy policies on the poll – and in many cases those differences have widened over time. As in previous Pew Research Center polls, one of the largest gaps between the parties is on the question of offshore drilling. Nearly eight in-ten Republicans (79%) – and 90% of Republicans and Republican leaners who agree with the Tea Party – support allowing more offshore oil and gas drilling, compared with 44% of Democrats. Democrats are far more supportive than Republicans of stricter emission limits on power plants to address climate change; 74% of Democrats favor this compared with 67% of independents and 52% of Republicans. 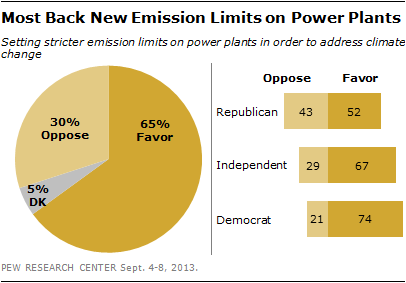 Still, even among Republicans there is more support than opposition to emission limits (52% favor, 43% oppose). And when asked which should be the more important priority for addressing the nation’s energy supply, large majorities of both Democrats (71%) and independents (60%) say it is more important to develop alternative sources, such as wind, solar and hydrogen technology. 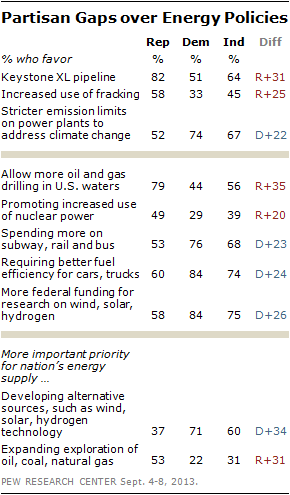 A smaller majority of Republicans (53%) say the priority should be expanding exploration of oil, coal and natural gas. Just a few years ago, there was broad agreement on some – though not all – energy policy objectives. In 2006, during George W. Bush’s presidency, comparable majorities of independents (85%), Republicans (82%) and Democrats (77%) favored increasing federal funding for research on wind, solar and hydrogen technology. Since then, support for funding alternative technology research has fallen by 24 points among Republicans (to 58%) and 10 points among independents (75%), while increasing slightly among Democrats (84%). Much of the change in opinions among Republicans came after Barack Obama took office in 2009. In September 2008, 85% of Republicans and 77% of independents favor increased funding for alternative energy research; in May of 2010, 61% of Republicans and 73% of independents favored more funding for alternative energy research. There has been a similar trend in opinions about requiring better fuel efficiency for cars, trucks and SUVs. 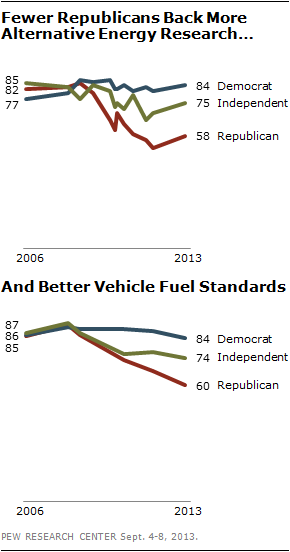 Seven years ago, large majorities across all partisan groups (87% of independents, 86% of Democrats and 85% of Republicans) favored higher fuel efficiency standards. The percentage of Democrats favoring this has changed little over this period (currently 84% favor), while falling 25 points among Republicans and 13 points among independents. On some energy policy-related issues, however, such as nuclear power and offshore drilling, partisan differences have remained fairly steady over the years. Currently, 49% of Republicans, 39% of independents and 29% of Democrats favor promoting the increased use of nuclear power. In 2006, 56% of Republicans, 38% of independents and 39% of Democrats supported more nuclear power. In September 2008, 87% of Republicans, 67% of independents and 55% of Democrats favored more drilling in U.S. waters. Today, there is less support across all three groups, but the partisan gap is about as large as it was then (35 points now, 32 points in September 2008).